Cartilage cannot heal itself. Injure a knee joint, and the cartilage will keep degrading until the only alternative is a knee replacement. At best, this will last 15 years and the surgery can only be repeated a few times. At DELTAi, engineering cartilage is truly a joint effort. A group of postdocs in the lab of Distinguished Professor of Biomedical Engineering Kyriacos Athanasiou are developing a portfolio of technologies to create tissue-engineered human cartilage that could help damaged joints heal. 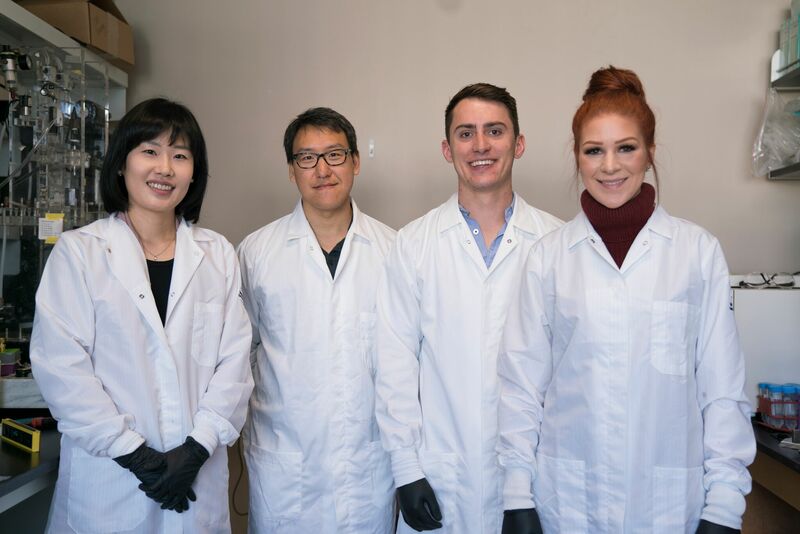 Postdocs Heenam Kwon, Ph.D. and Wendy Brown, Ph.D., along with Principal Development Engineer Jerry Hu, Ph.D., are growing human knee cartilage cells called articular chondrocytes (hACs). The cartilage constructs engineered from these hACs have properties similar to native cartilage, and Kwon, Brown and Hu hope to develop processes for the eventual mass production of these engineered constructs to replace injured cartilage. “In the body, chondrocytes do not proliferate,” said Hu. “We have developed a way to make them grow in the lab.” Kwon, Brown and Hu came with Athanasiou to UCI from the biomedical engineering department at UC Davis, which Athanasiou formerly chaired. Athanasiou is experienced at commercializing biomedical products. In the 1990s, he and his collaborators patented the only product in the world at the time for treating small lesions in articular cartilage. Athanasiou has developed 15 FDA-approved products through the multiple companies he has founded. Knee replacements are already common, but as more Americans live longer and experience degenerative diseases such as osteoarthritis, it is likely that they will outlive their knee replacements. According to the Agency for Healthcare Research and Quality (AHRQ), total knee replacements were the most frequent inpatient procedure in 2010. That year, an estimated 693,400 procedures were performed on patients aged 45 and older. In research presented at the 2014 annual meeting of the American Academy of Orthopaedic Surgeons (AAOS) about 4.7 million Americans are currently living with a knee replacement. The total number of knee replacements increased by 120% per year, from 282,350 knee replacements in 2000 to 621,029 in 2009—and the number in people between 45 to 64 increased by 188% compared to an increase of 89% for people between 65 to 84. As more people require knee cartilage therapies at younger ages, total joint replacements become a less viable option because they can only be repeated a few times at most. But halting the injury cascade, once started, is challenging. “Even if it is very, very small, since cartilage doesn’t heal, it is just going to get worse,” said Brown.“Because of the mechanics, that very small hole or crack is going to get worn down even more and just slowly take over the entire joint. So the goal is to intervene at the earliest possible point.” Surgical techniques to implant artificial joints and grafts have improved in recent years, but still cannot functionally replace living cartilage tissue. Current methods involve either surgically implanting autografts, allografts, or as a last resort artificial joints. In surgery, the surgeon removes damaged cartilage and bone from the femur, tibia and sometimes the patella, then replaces them with either grafts or prosthetics. Each method has drawbacks. Autografts are in limited supply. Autograft cartilage, as well as donor cartilage, in a process called matrix-assisted autologous chondrocyte implantation (MACI), which uses cultured autologous chondrocytes, is taken from a non load-bearing part of the knee. With current cell-based approaches, “…you might get five years, depending how active you are, but ultimately that repair tissue may mechanically break down and degrade and you may be back to where you started or even worse,”said Brown. Moreover, current cell-based therapies depend on using membranes, so they lack the structure and strength necessary to withstand the compressive forces within a joint. Another technique is implanting allogenic cartilage, in which grafts are transplanted from somebody else into the injury site. According to Brown, experiencing rejection from other people’s cartilage is “really pretty rare” as cartilage is considered to be immune-privileged. “It is not as immune privileged as people think, but the degree of reactivity depends on the location of the implant,” said Brown. For knee replacements, “…they trim off the contoured portions [of the knee] to fit the implant.” said Hu. “A lot of bone and tissue gets discarded.” Additionally, artificial joints do not function as well as healthy native joints. hAC isolation: To get a robust starter population of cells, cartilage cells are isolated from donors and purified, eliminating contaminating cell types and damaged or unhealthy cells. Chondrogenically-tuned expansion: In a process called passaging, the round cartilage cells are seeded onto a plate in a single layer in chondrogenic growth medium where they proliferate until they reach the desired density. The cells can be expanded over nine times to yield, 1.5 million cells from one donor cell. Material gained from a 1 mm ^3 biopsy can resurface about 75 knees. Self-assembly: The cartilage cells are seeded into non-stick wells where they interact with each other and form three-dimensional cartilage tissue. Chemicals and growth factors are added to help the cells become more chondrogenic and enhance their ability to make cartilage-specific matrix. Matrix modification: Chemical and mechanical stimuli are applied to the maturing engineered cartilage to further enhance it, resulting in constructs that functionally resemble native cartilage.